My husband loves cheesecake truly LOVES it so much. I on the other hand would not miss it if I never had it again. Which works to his benefit because he knows if we order a slice he gets the whole piece minus a tiny bite. So in making him happy I am always looking for a good cheesecake recipe I came across this one at a friends dinner party. 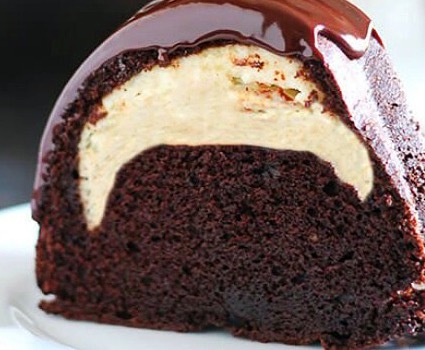 It is a bundt cake cheesecake, say that ten times fast. She was kind enough to share her recipe and let’s say it’s a hit with all my cheesecake loving friends and family. This makes a great Holiday gift or dessert to bring to any get together. In the bowl of an electric mixer, beat the cream cheese and sugar until well combined. Add the egg, vanilla, and flour until well combined. Set aside. Combine the cocoa, chocolate, and espresso powder in a large bowl. Pour the boiling water into the bowl and cover. In a small bowl whisk together the flour, salt, and baking soda. Whisk the chocolate mixture until it is smooth. Let cool to room temperature. When it has cooled, whisk in the sour cream. In a bowl beat the butter, brown sugar, and vanilla for about 3 minutes, or until light and fluffy. Add the eggs, one at a time, until combined. On low speed gradually add the flour mixture and the melted chocolate mixture alternating, beginning and ending with the flour, until the batter is smooth. Pour a little more than half the batter into the prepared pan. Pour the cheesecake filling into the center of the batter, not allowing it to touch the edges of the pan. Pour the remaining batter over the filling. Bake the cake for about 50 minutes, or until a toothpick comes out with moist crumbs. Let cool on a rack for 10 minutes, then turn the cake out and let cool completely. In a small saucepan heat the cream and sugar over medium heat until well dissolved and to a light boil. Remove from heat and add the chocolate, whisking until smooth. Let cool slightly until thickened. Drizzle over the cake. Let cool for about 20 minutes and enjoy. Happy Baking!